Posted on January 8, 2017 by bestbritishwriter Posted in Writing Services Reviews	. 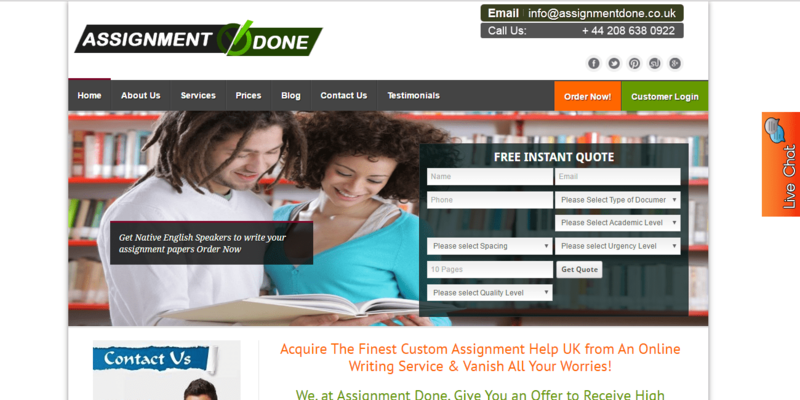 AssignmentDone.co.uk is a relatively new custom writing company, offering academic assistance to students since 2014. According to this provider, students need to spend 10-15 hours every day on writing and reading tasks, which is a bit exaggerated. However, their point here is that the company can provide high quality papers to students who need help with their assignments. Is this true and should you choose this company for your papers? “I honestly think that choosing this service was the biggest mistake I have ever made! They overcharged me for a horrible paper, even though they say their prices are the cheapest.” – Veronica Graham. “Prices are good for me, but I did not like the customer service. They were rude and unhelpful when I asked for a revision and I even had to convince them I needed it!” – Joseph Seeber. A separate page called Services is existent on the website, but it is completely empty. After spending half an hour scouring the website, we have found out that the only way to know if the company offers your paper is if you check the dropdown list in the ordering section. According to this list, AssignmentDone offers all commonly requested papers such as essays, dissertations, case studies, term papers, research papers; and some more specific such as presentations, multiple choice questions, personal statements etc. Aside from the lack of information on the website, the company offers a wide range of services. Prices depend on type of paper, quality of paper, number of pages and urgency. Interestingly, they do not depend on the academic level of the student, so the same paper for undergraduate, graduate and even Master’s program would cost the same. An essay of standard quality with a deadline of 10 dayscosts £10.39, while that of premium quality and deadline of 24 hours costs £21.58. A dissertation comes with shortest deadline of 7 days and costs £19.19 per page. This makes the company an affordable one. As for discounts, the only existing discount on the website is 15% off first orders. There is no loyalty program, which makes assignmentdone.co.uk a bad choice for those in need of a regular academic paper provider. Additionally, we found no bulk order discounts, either. Checking the quality of papers was very important to us while making this evaluation because of the fact that the company charged the same for all academic levels. This is why we ordered a research paper of premium quality. The company says their papers are of highest quality, but we had a completely different experience. The premium quality research paper was delivered to us on time, but contained many mistakes that make us believe the writers in the company are not native. Furthermore, the quality was not even near premium, which makes us wonder what a standard quality research paper would look like. The website is easy to navigate and looks trendy. The only disadvantages here are that the company left the Services page empty and their content is a bit exaggerated, containing content such as ‘is your assignment giving you nightmares?’. You can contact the company via live chat, e-mail or the phone number on the website. We were satisfied by the work of the live chat agent, who sent our paper for a revision immediately when we requested this. However, the paper was still of bad quality even after the revision. Considering all this, assignmentdone.co.uk is not a service we would recommend. The reason for this is thateven though the pricing is good, the content we received was not of high quality as the company promised. In addition, this is not a great choice for students who order their papers regularly because of their lack of loyalty discounts. No plagiarism is a scam. Checked my assignment and it was all copied from other sources. Waiting to get my money back.